Many manufacturing jobs require a physical presence to operate machinery. But what if such jobs could be done remotely? This week researchers from MIT's Computer Science and Artificial Intelligence Laboratory (CSAIL) presented a virtual-reality (VR) system that lets you teleoperate a robot using an Oculus Rift headset. The system embeds the user in a VR control room with multiple sensor displays, making it feel like they are inside the robot's head. By using gestures, users can match their movements to the robot's to complete various tasks. "A system like this could eventually help humans supervise robots from a distance," says CSAIL postdoctoral associate Jeffrey Lipton, who was lead author on a related paper about the system. "By teleoperating robots from home, blue-collar workers would be able to tele-commute and benefit from the IT revolution just as white-collars workers do now." The researchers even imagine that such a system could help employ increasing numbers of jobless video-gamers by "game-ifying" manufacturing positions. 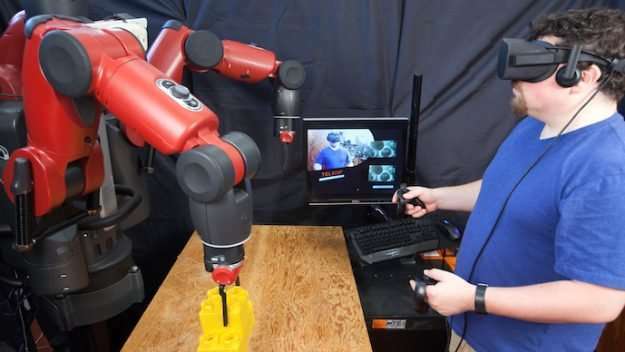 The team demonstrated their VC control approach with the Baxter humanoid robot from Rethink Robotics, but said that the approach can work on other robot platforms and is also compatible with the HTC Vive headset. Lipton co-wrote the paper with CSAIL director Daniela Rus and researcher Aidan Fay. They presented the paper this week at the IEEE/RSJ International Conference on Intelligent Robots and Systems (IROS) in Vancouver. There have traditionally been two main approaches to using VR for teleoperation. In a "direct" model, the user's vision is directly coupled to the robot's state. With these systems, a delayed signal could lead to nausea and headaches, and the user's viewpoint is limited to one perspective. In the "cyber-physical" model, the user is separate from the robot. The user interacts with a virtual copy of the robot and the environment. This requires much more data, and specialized spaces. The CSAIL team's system is halfway between these two methods. It solves the delay problem, since the user is constantly receiving visual feedback from the virtual world. It also solves the the cyber-physical issue of being distinct from the robot: once a user puts on the headset and logs into the system, they will feel as if they are inside Baxter's head. The system mimics the "homunculus model of mind" - the idea that there's a small human inside our brains controlling our actions, viewing the images we see and understanding them for us. While it's a peculiar idea for humans, for robots it fits: "inside" the robot is a human in a control room, seeing through its eyes and controlling its actions. Using Oculus' controllers, users can interact with controls that appear in the virtual space to open and close the hand grippers to pick up, move, and retrieve items. A user can plan movements based on the distance between the arm's location marker and their hand while looking at the live display of the arm. To make these movements possible, the human's space is mapped into the virtual space, and the virtual space is then mapped into the robot space to provide a sense of co-location. The system is also more flexible compared to previous systems that require many resources. Other systems might extract 2-D information from each camera, build out a full 3-D model of the environment, and then process and redisplay the data. To test the system, the team first teleoperated Baxter to do simple tasks like picking up screws or stapling wires. They then had the test users teleoperate the robot to pick up and stack blocks. Users successfully completed the tasks at a much higher rate compared to the "direct" model. Unsurprisingly, users with gaming experience had much more ease with the system. Tested against state-of-the-art systems, CSAIL's system was better at grasping objects 95 percent of the time and 57 percent faster at doing tasks. The team also showed that the system could pilot the robot from hundreds of miles away, testing it on a hotel's wireless network in Washington, DC to control Baxter at MIT. "This contribution represents a major milestone in the effort to connect the user with the robot's space in an intuitive, natural, and effective manner." says Oussama Khatib, a computer science professor at Stanford University who was not involved in the paper. The team eventually wants to focus on making the system more scalable, with many users and different types of robots that can be compatible with current automation technologies.